I took delivery of a Jimmy Jet for Christmas of 1966. This is one of my all-time favorite toys. Pre-EBAY, it took me 2 years to find one, in only fair shape. I since have bought another. These are rather expensive to come by now, and because there is a lot of thin plastic pieces on it, quite often the ones you find are missing parts. Both mine are missing parts or have some broken pieces, but I have both working. This is another of Deluxe Reading's 'Supermarket Toys', sold in the 60s in supermarkets and drug stores. Deluxe Reading also sold the X-500 Playset and the Playmobile Dashboard via this channel, and you can read about both elsewhere on this site. Like those other toys, this is highly stylized with a liberal use of chromed plastic. Although made in the 60s, this is pure 50s sci-fi. Or perhaps modern Russian equipment. Nevertheless, this is a really interesting toy. The premise is that you are at a cockpit of a fighter plane. When you turn on the toy via the right "stick", the screen in front lights up, and the throttle on the left controls your speed. 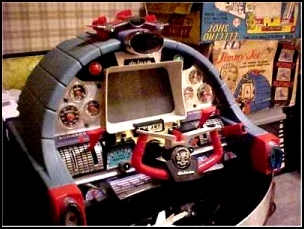 What you see on the screen is a silhouette of a jet fighter, which you can move back and forth with the steering wheel. The landscape underneath the jet moves. This is accompanied by a loud motor sound. The pilot can also look out the site at the top of the console, and site various things in whatever room he is playing in. He can the fire missiles into the room. Overall, a really fun toy. My original was destroyed in a flood in our home, along with, get this, my Playmobile Dashboard and my Eldon Bowl-a-Matic, along with alot of classic board games. My parents tried to rebuy all of these, but they were no longer made. Of course, there were none of the wonderful secondary markets available today back then. So I finally got one a few years ago. I always assumed that they were made by Ideal or something. Other interesting notes: Both of my toys have the same landscape, a harbor with bridges, rocket launcher and buildings. I swear that the one I had as a kid had a different landscape. Also, I distinctly remember that mine did not say "TV Jet" above the wheel in the gold stick-on. I remember mine saying "Jimmy Jet" in script.